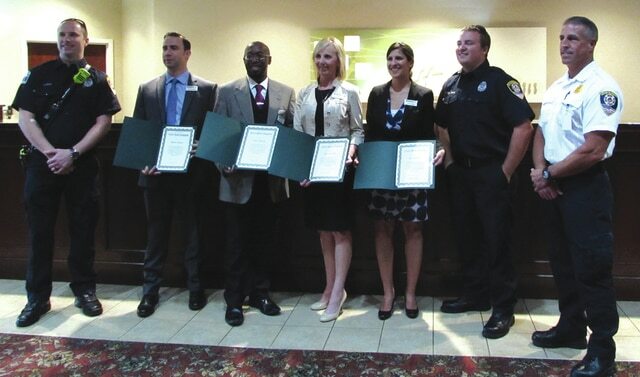 Jonathan Gallardo | Fairborn Herald Pictured left to right: Carle Fugate, Matthew Pauley, Jelani Johnson, Dianna Cordle, Jackie Morris, Colton Trego, and Fire Chief Mike Riley. Not pictured Kimberley Peterson. FAIRBORN — The Fairborn Fire Department recognized four Dayton-Fairborn Holiday Inn employees Thursday afternoon for saving the life of a 15-month-old child. On May 11, a family came into the hotel to look at some banquet space. “They were trying to host an event here for their son and we were showing them the back room — and literally, we were in there like three minutes or so, and this little boy started showing signs that he was choking,” said employee Jacquelyn Morris. The boy had gotten a piece of candy lodged in his throat. Morris was the first one to notice what was going on, but she and her fellow employees acted quickly. The fire department was alerted, and while waiting for its arrival, Morris, along with Dianna Cordle, Jelani Johnson and Kimberley Peterson, worked together to help the boy. For three minutes, the group tried to dislodge the candy by delivering back blows and finger sweeps. They were able to remove the candy from the boy’s throat, and the ambulance showed up soon after. The fire department commended the four employees for thinking and acting quickly in a situation where most others would have been frozen. Fairborn Fire Chief Mike Riley pointed out that these people were trained in CPR and thus were able to save the boy’s life. He emphasized the importance of being trained in CPR.